Spring time comes real early for chicken farms… So deep in winter…. When people are warm and snug in their homes not even THINKING about chickens, most farmers are planning ahead on next years spring sellers. I’m no “eggsception” to that rule. When raising chicks in volume (600 to 800 or more per batch) some companies raise in the THOUSANDS. Depending on season and what is projected we have a large number of chicks in brooder at any time. It can take 8 weeks to get a baby egg laying breed into the juvenile sized of pullets ready for outdoors. (depending on weather) So to be ready for spring, this process must be started at the end of fall or in the cold of winter. What have I learned about raising many baby chicks at once? 1st.. its not easy, its frustrating to get everything “just right” and irritating to have the “acceptable” losses of 2% to 3% losses per batch of young chicks up until the first week. 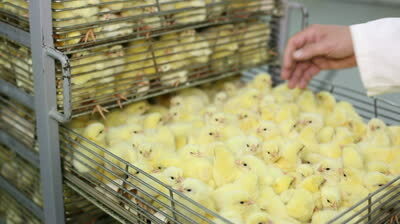 Many chicks cannot process feed or water upon hatching and will die about 3/5 days from hatching. its just the law of large numbers and good old Mother Nature. Not all animals are born perfect. Sad but true. Heat, heat and more heat and lots of it… this is what makes winter and fall chicks so difficult to raise. Adding hay, lights and HEATERS plus ventilation to keep the brooder room at 85 to 95 degrees is difficult to say the least with temperature drops. Texas weather can change from 85 degrees in the day to 28 at night…. so no amount of preparation is always perfect in these instances. Lets talk about “poop mat” the poop that builds up in the brooder room over several days must be cleaned and removed properly. What is poop mat? its not only chick poop.. but its also includes “biofilm” of trillions of bacteria where germs live and thrive in the warm moist droppings. This is why its so important to have the proper bacterial growth on the area where baby chicks walk and eat. 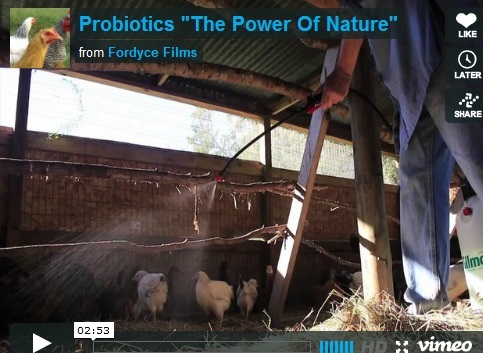 Since I have used Chrisal probiotics in my chicken production. in ALL areas of production, I have noticed much lower losses, no odor and the chickens are bursting in health and vigor. All ages. The best way to raise chickens is in the healthy and safe way. natural organic probiotics have ensured Blue Star Ranch batch after batch of the healthiest chickens anywhere in Texas. But its important to continue safe health practices and KEEP your chickens in the best environment possible. Baby chick mortality… again this happens in large batches from chicks pecking at each other, squishing and pressing together. Even with ample room, sometimes chickens get into a “swarm” and baby chicks can smother each other. ( a real aggravating loss! ggrrrr…) So again back to the proper temperature too. So if I find a section of room (usually if lights are close together) chicks “swarm” in these areas. I shut down a heat lamp and or add plastic buckets to that area to disperse the crowd of chicks. If you think of raising chicks in large batches, please make out yourself a diagram of where your light and heat sources are coming from. Then start with a “test batch” of 25 chicks.. make sure your room and all light and heat sources are in order. DON’T make your first batch a huge batch…. start slow and add a few more each season. its not as easy as it looks. Be sure to contact Blue Star Ranch if you have any questions. See you all next time.